Hoba Steel complements these two elements in the SPIN Tiles range with their functionality. Since 1987 Hoba Steel manufactures SPIN tiles with modular size systems and individual shapes for the professional use. We are able to collaborate with our clients and develop innovative ways to translate their needs. SPIN tiles with the highest quality and design attributes, for your cutting- edge and innovative ideas. The intelligent technology used on the material, the possibility of numerous and individual shapes and not least the functionality are some of the reasons why SPIN is a part of building constructions in both the urban areas and in the residential section. company foundation as “Bernd Hoffmann Bauprofile”. products: stainless steel profiles and aluminium profiles. company name changed to“HOBA STEEL PRODUCTS”. The product name “SPIN” became the brand name for high quality stainless steel tiles. Participation at international fairs, first achievements with the SPIN tiles at commercial projects (department stores). 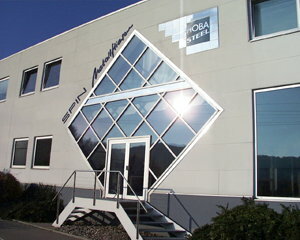 formation of a GmbH: HOBA STEEL GmbH, the SPIN tile production achieve a contigent of more than 50% of the total capacity of the production. registration of the brand name SPIN®. The production includes more than 300 sizes and design surfaces. The production of the profile program was discontinued..
SPIN® is almost worldwide available through sales representatives and speciality retailers. International fairs and showrooms are used as presentation areas. launch of the new product line „SPIN® mosaic“ as well as the new surface „SPIN® PEARL“. SPIN® conquer the Spanish market: area-wide introduction of the stainless steel tiles and a presentation on the CEVISAMA fair in Valencia. new product group SPON® – tiles made of natural stone. First tile series with natural slate. SPIN® SHOWER: shower elements for the on grade installation is released. new product group SPIN® SAFE – the orienation system for blind and visually impaired people (DIN 32984). worldwide distribution; sales representatives in the Switzerland, in the USA and Netherlands, France, Russia, Great Britian, Austria, Belgium, Italy, Denmark, Spain and Portugal. top quality marketing concepts with a planning concept for the retail market, presentation, sales assistance and local professional training.